Introducing Windows Live Response Collection modules...and how to write your own! Hello again readers and welcome back. Today I am very happy to announce the public release of the latest round of updates to the Live Response Collection. This release focuses on the "modules" that I touched briefly on in the last update. The size of the six main scripts themselves has been greatly reduced and almost all of the code now resides in the folder "Scripts\Windows-Modules". This makes maintaining the code easier (since all six scripts share a large majority of the code, it only has to be edited once instead of six times) and allows even greater customization opportunities for end users. There are some small changes to the way the LRC handles data, including a built in check to ensure the date stamp does not have weird characters, which was seen on some UK based systems. The script now attempts to decipher that data properly but, in the event that it cannot, it tries to ensure that backslashes are removed from the date field so that way the output of the tools and system calls are stored properly. The main focus of this update is demonstrating how easy it is to create your own module. I attempted to make this process as easy as possible, so if you want to write/add modules, you can do so very easily. Since it is written in batch, you can write your own module however you would like, but following this methodology should present the best results and ensure that the script will error out rather than possibly present bad data to you. The first thing you have to do is choose an executable (or system call) that you would like to add. In this particular case, I decided that the "Wireless NetView" executable from nirsoft would be a good choice for the walk through. The first thing you have to do is to download the zip file from their website. Once that is done, navigate to the folder and unzip the file. Once that is done, you should see a folder like this. 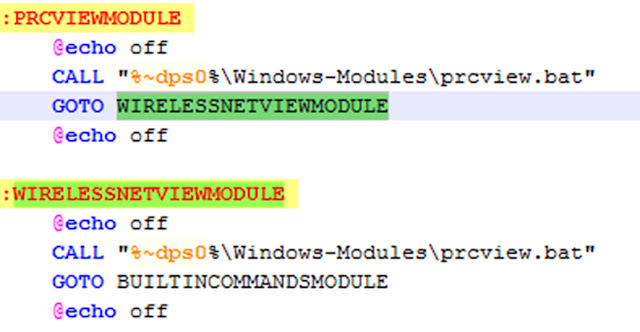 Contents of the folder "wirelessnetview"
Copy that folder to the "Tools" directory under the Windows Live Response folder. Once that is done, you are ready to begin writing your module! This version of the Live Response Collection contains a file in the "Windows-Modules" folder called "Windows-Module-Template.bat". Open that file in your favorite text editing program. Once you have it open, save it as the tool name that you would like to run. In this case, I would open the file "Windows-Module-Template.bat" and save it as "wirelessnetview.bat". Now you can begin to edit the "wirelessnetview.bat" module and add more functionality to the LRC! [Output folder] - The folder that you want to output the data to. Since this is network related, saving it under "NetworkInfo" seems like a good idea. [Output file name and file extension] - The filename that you want to save the file as. Generally I make this the name of the tool, so I would call this one "Wirelessnetview.html". Screenshot of our new module, after replacing the text! Now that our module is written, we have to add the module to whichever batch scripts we would like. I usually like to keep the modules that perform similar functions near each other, so in this case I am going to choose to add it after the PRCVIEWMODULE. The easiest way to do this is simply copy the five lines of text associated with the PRCVIEWMODULE entry, and paste it below it. 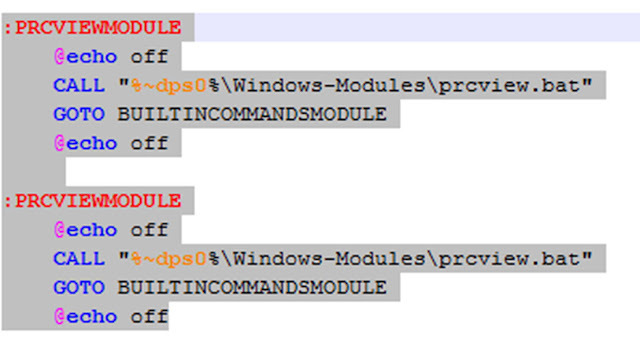 Once you have it copied, change the line GOTO ....MODULE in the original module to the name of your new module. In this case, we would change it to GOTO WIRELESSNETVIEWMODULE. Then change the name of the subroutine itself to the name of your module, in this case WIRELESSNETVIEWMODULE. Finally, change the name of the batch script that is being called to the name of your newly created script, then save it. That is it, you are all done! Our module is fully added! It is best to run your module(s) on a test system before deploying it widely, just to ensure that everything works properly. Also ensure that you add the code for your new module to each of the six batch scripts, if you so desire. I hope that this tutorial has been helpful, please do not hesitate to contact me if you have any additional questions or comments as you create your own modules for the Live Response Collection!